OK,I HAVE TO SAY I’M IMPRESSED WITH THE MPG OF MY TRUCK AFTER USING THE MAGIC BULLET ADDITIVE !!!! AFTER 200MILES OF DRIVING, THE SAME ROUTE AND MPH AS ALLWAYS, I HAVE AN INCREASE OF 3MPG !!!!!! MEANS ALOT TO ME WITH GAS PRICES THESE DAYS!!!! HELLO RON, I own a 1997 Honda Goldwing with 127,233 miles. I have seen a improved gas mileage, preformance, as if it had the ORIG 52,000 MILES WHEN I BOUGHT THIS BIKE! I have added this product to 5 fiil ups WOW!!! I ride to work 85 miles everyday. MAGICBULLET OUT PREFORMS Anything i have every tried. “Man I took my bike out on Saturday and worked on my hole shot. That Magic Bullet was kicking in and gave me a lot more horsepower.. I left the line like I never have before.!!!!!!!! 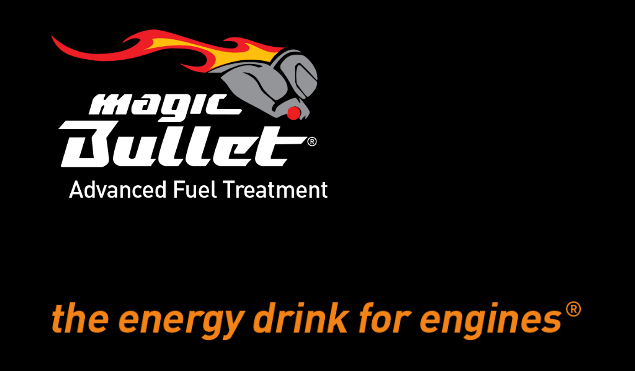 If you own a stock 2011-2013 zx10r, run some of the magic bullet fuel treatment in it! Trust me when I say you will feel a nice power increase. The bike started to accelerate like the ecu had been flashed! Wonderful stuff! Hi Ron, wanted to let you know about the magic bullet. I have a 1989 mercury grand marquis with 107,000 miles. It was running a little rough & pinged ,rattled & knocked on a hard acceleration. The local ford dealer told me it was cheap fuel. So i ran 93 high test and no change. So then i tried stp, lucas, gummout, marvel mystery oil and few others. Saw no difference. But then i used the magic bullet!!!!!!!! Wow i was like a new car. No more pings, rattles or knocks!!!!! The car even idles smother & has more power. All i can say is i have tried the rest now i will keep using the best!!! I also have a 2004 Harley 1200 sportster custom. I just started using it and already have seen more power & response from the magic bullet. Hello, as you know I was sceptical of these kind of fuel potions but after speaking to you the other week and explaining that the car was difficult to start and felt lacking slightly in power I gave it a go, I did as you said 1 full bottle of Magic to start with and within 40miles I could feel it was having an effect, now 100 miles later the starting problem has gone completely and the lack of power is getting better all the time. By the time I’m through the second bottle I’m confident my car will be back to its old self if not even better. After spending a fortune at my local garage having them look at the problems I was experiencing, I cannot believe a couple of bottles of Magic Bullet are showing such results at a fraction of the cost my garage were charging to get nowhere, I would have no problem recommending Magic Bullet to anybody before spending money at a garage or even as a preventative measure. Ron, we tried it in my Dad’s Truck and it is amazing! We will be using it in the bikes as well!! I would love to promote your products. Still getting good results from the stuff. We’ve free’d up the injectors on a VFR800. Simple AMAZING!!! Giving it a good run on the dyno helped too I’m sure, but we’re definately impressed! Fun times with the Magic Bullet! We put some in an R1 with minging carb issues (they kept growing mould on the inside?!) We ultrasonically cleaned them, and treated with Magic Bullet. The throttle response is so smooth and sharp now. We love it! Remind me for the cost of a crate of the stuff? I’m very keen on getting some for the dyno day. I’d be amazing if you could make it down to explain it/present it, and sell it, as Gary and I will be on and off the dyno all day! Just a quick email to let you know I am getting on with the Magic Bullet.As you know I do a bit of Stock car racing and have used it in my stock, I found it to improve the performance slightly straight away and it has just got better and better with every race,now 8 races in and it has certainly helped me to be a bit more competitive the throttle response and power delivery have got much sharper. I was so impressed with Magic Bullet that I have now used it in my BMW320d and have seen a 5% improvement in MPG return according to the onboard computer. Many thanks for all your help and advise over these last 12 weeks and I will be in touch soon as I am down to my last 2 bottles. My Car has always struggled with the diesel emission test over the years I have been using Magic Bullet for a couple of months now prior to the MOT and this year it flew through. The Garage want to know what I have used to make such a difference so you may be hearing from them soon. Once again thanks for all you help and advice it is nice to know there are still people willing to help others in this day and age. Hi just thought I would let you know the magic bullet arrived last week and I used it as directed and I would just like to say this is a great product and works brilliantly! Cheers. Hi I tried magic bullet in my 07 vectra diesel after talking to the guys at the motorbike show in belfast about the problems with the cat on my car clogging up due to poor grade fuel,stanley advised me that one or two treatments would sort it out,true to his word it worked i cant believe the difference this has made to my car i was about to change the car as i thought it had got sluggish but i have changed them thoughts as the cars performance is back to the same as it was new,this is not like the other products that claim to save fuel and add performance this cleans your system and DOES WHAT IT SAYS ON THE TIN .im now going to try it on an old motorbike to see will it give the same results. many thanks stanley you were true to your word . Hi steve,appreciate your quick response i put 100ml into my 76 honda 400/4 with 3k on the clock,bike seemed smoother and more free.bought magic bullet[bikes] for my 92 fireblade 25k on the clock,again bike seemed too change around 16 miles into journey,but porta/ferry road was choked with cyclists,i know a better road. My name is tom newton and i am massive fan of your magic bullet product, i use a bottle every time i fill the tank on my motobike and have recommended it to many other biker friends who now use it as often as i do. As i love magic bullet so much i was wondering if it would be possible for me to have some free stickers to put on my motorbike and possibly some friends bikes, so it will not only look great but also advertise your product. Hi all, just to let you know been using Magic Bullet now for about 2 weeks on my 21 year old Yamaha ZFR 1000, and I must say I have felt a big improvement it feels more looser and revs much better and higher with ease. Thanks PS any chance of any stickers? Hello thanks for the speedy delivery, I used the Magic Bullet and my car feels like it did years ago. So here is my thoughts on using Magic Bullet over the last 2 weeks……..
Well the bike was in the garage since September last year with the old petrol in, so out she come and i went down to get 15 lt of fuel as per instruction and filled her up, then went in the Magic Bullet. Being in the garage she was very sluggish at first when i took her out for a test ride and was open minded on how Magic Bullet would work. After 20 odd miles playing around i noticed that the engine and throttle response was extremely sensitive and a lot smoother especially when gearing into and out of corners. The power through the throttle seemed a lot more instant than normal when coming out of corners and even getting out of sticky situations was very quick to respond. Must say I am very impressed with Magic Bullet it certainly works on my motorbike even after one dosage , the accelleration and performance is a definate improvement and feels like shes brand new, with the added bonus of de-coking and cleaning my engine, brilliant !!!!!! Let me know how Brans went…. I spoke to Stanley, on wednesday night about some testing we did with Magic Bullet in my son,s 2 stroke kart.We carried out several tests of 10 laps each with shell optimax fuel without Magic Bullet in it.Then using the same gearing tyre pressures and checking track temperature and air temperature we did several 10 lap tests with Magic Bullet fitted. The results showed an improvement in lap times of 2/10ths per lap.The jetting remained the same throughout all the tests and after checking the plug several times it became obvious that the plug was a lot cleaner and the mixture appeared to be burning correctly and more consistantly. Callum said the kart had better throttle response than before. I intend to test it at Neil Bolds workshop on his dyno when he next tests a formula ford engine and will tell you the results. I bought your product at the BMF Peterborough weekend of 14th May and must say this has given a new lease of life to my 30 year old Suzuki GS250T. It is now a pleasure to ride the “old girl again” she has been restored to her former self. Performance has improved, she seems cleaner and sounds different. Fuel consumption seems to go quite a bit further too. Money well spent and would recommend this product to all. We went testing last Sunday using a 320 Maico (two stroke).We had a our normal fuel mixture using pro-boost Maxima oil and we added the magic bullet as per instructions. We did not get a great deal of track time due to conditions being extremely wet but there was definitely a noticeable difference in the engine performance and a cleaner plug.We are out again this coming Sunday and will keep you informed. Was at the NCE on Tuesday and picked up two of you Magic Bullets. Well, today in a very wet & cold Wiltshire l fired up my FJR1300 (04) with 23,500 miles on the clock, stuck in a bottle of Magic Bullet, then placed 20lts of fuel in the tank. Then hit the roads, riding over the first 15 – 20 miles the bike felt the same (the old Brain cell was thinking ” oh well that’s another £10 down the drain” !) Not long after that,while filtering through traffic, l noticed that the response from the bike was a LOT more rapid at the lower end, seeming to pick up better from the low revs which to me by surprise. After a 120 mile round trip I found the bike responded very well indeed, ” Officer I was not speeding, I was making progress” ; – ) & ran cooler while stuck in traffic. First impressions are cracking. Will be using the other bottle in a few days time. I have been racing a honda twin engine pro kart all year at Nutts Corner, Bishops Court and Kirkistown, with mixed results throughout the season. This being my first season, we had some reliability problems at the start but midway through we became more competitive. Fortunatley we fell in with the magic bullet product for our last meeting of the year at kirkistown. This meeting was are most successful as we picked up our best results of the season. After adding the magic bullet it seemed to give the engines the edge that we haddn’t had all year. Without a shadow of a doubt the engines performed the best they have a year. I wish we had the magic bullet from the start of the year, and i am really looking forward to next year. I bought a bottle from you at the NEC to use in my 1990 GSX1100f. This bike has not had any engine work done for years but still pulls well. After adding your product and taking a short spin I found that the engine was indeed more responsive and it is now running a lot sweeter. I will recommend this to all my friends and will use again.ps Good luck in the BSB.